Just what your Summer Party needs to let your guests enjoy hours of "fun in the sun" while keeping cool at the same time! Cool, wet sliding fun and a tropical theme. Your party will only get better as it gets wetter! 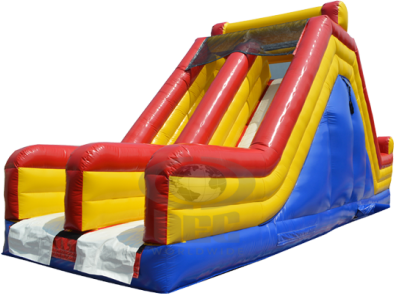 Combines obstacles, a rock wall and dual slides for 22' of excitement and hours of fun. Dual lane dry slide. Kids can slide down both sides at the same time. Two lanes eliminate long lines. The back side is a rock climbing wall that offers a real vertical challenge. A giant slide awaits you on the other side. The top of the line obstacle course! Huge 38' L x 26' W x 16' H. Three sections (can be rented separately). Two slides, two jumping areas, a climbing wall and several pop-up obstacles. Will hold up to 10 kids at once. The Big Kahuna dual wet/dry slide is a great way to cool off this summer. Children and adults alike can slip and slide their way down this 17 foot slide.